SAN FRANCISCO (AP) — Crews began work to shore up two cracked support beams that have shuttered a celebrated and newly opened $2 billion San Francisco transit center, authorities said Thursday. Workers removed ceiling panels and light fixtures at the Salesforce Transit Center ahead of installing a system to support the beams that could begin this weekend. The system is being designed. The center is expected to stay closed at least through the end of next week, said Mark Zabaneh, executive director of Transbay Joint Powers Authority, which operates the center. He ordered the center closed Tuesday evening. Officials are searching for the cause of the cracks, which could be the result of flawed fabrication, installation or design. The San Francisco Chronicle reported Thursday that a lawsuit filed in May could shed light on the cracking. In the lawsuit, the engineering firm in charge of the structural steel claimed that poor planning by general contractor Webcor/Obayashi led to significant cost overruns and that the firm is due money. Skanska USA Civil West claimed the job was compromised by “substantially defective and incomplete” construction documents. Sam Singer, a spokesman for the general contractor, told the newspaper that Skanska missed key project deadlines, leading to withheld payments. WHAT IS THE SALESFORCE TRANSIT CENTER? The multilevel building is a transit hub for commuter buses, and plans call for it eventually to include trains, too. 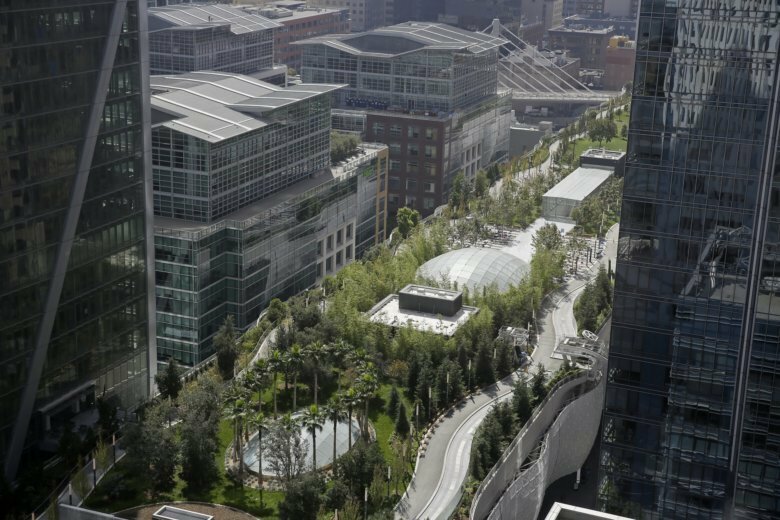 It spans three blocks and replaced the old Transbay Terminal, which was damaged by the 1989 Loma Prieta earthquake. The transit hub opened in August in the quickly developing South of Market neighborhood, which holds another troubled building. The transit center includes a 5-acre public rooftop park. Cracking support beams. Workers found the first crack in a steel beam Tuesday morning and a second, smaller crack later that day on a parallel beam. The initial crack is about 2½ feet (less than 1 meter) long and 4 inches (10 centimeters) deep on a steel beam holding up the transit center’s rooftop park. Two other similar beams do not show signs of cracking, Zabaneh said. WHERE DID THE STEEL COME FROM? Dennis Turchon, senior construction manager with the Transbay Joint Powers Authority, said seven U.S. companies provided 25,000 tons of steel for the project. Stockton, California-based Herrick Corp. provided the steel in the cracking beams and about a third of all the steel used on the project. Construction of the transit terminal was part of the U.S. Department of Transportation’s “Buy America” program. IS THE CRACKING RELATED TO THE SINKING OF A NEARBY RESIDENTIAL TOWER? Project officials and construction experts say the cracks are not connected to sinking of the nearby Millennium Tower, which has settled about 18 inches (45 centimeters) since it opened over a former landfill in 2009. But some homeowners have sued the developer and San Francisco, alleging construction of the transit facility caused the Millennium Tower to sink. HOW HAVE CITY LEADERS AND SALESFORCE RESPONDED? HOW IS THE SHUTDOWN AFFECTING TRAFFIC? Officials closed a street that runs under the beams, compounding problems in an already congested area made even more crowded by people attending a conference sponsored by Salesforce. The conference, which ends Friday, was expected to draw 170,000 people.